Is your house flood proof? 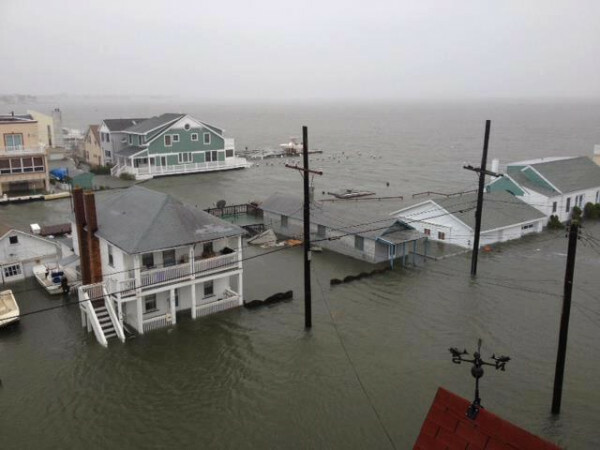 If we learned one thing from Hurricanes Katrina and Sandy it’s that existing houses do not float; they sink. Maybe we need to review the building codes for areas that are prone to high tides or river flooding. The Dutch have struggled with this issue since the country’s beginning, and by using clever engineering, the Dutch have designed some impressive floating architecture. They build regular houses; only these houses float when the water rises. 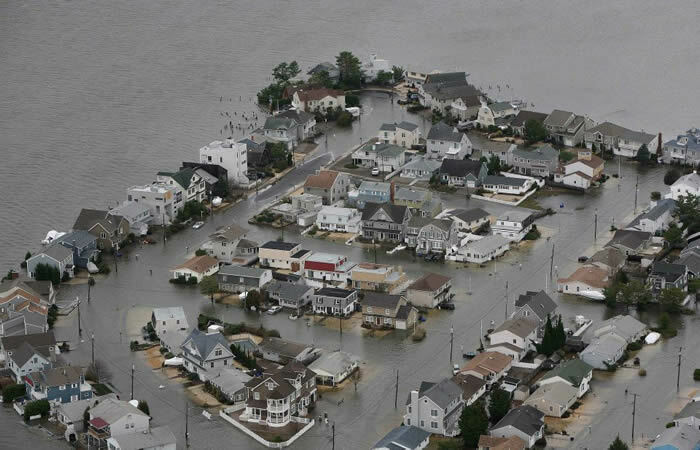 In the United States, floods are the costliest and most common natural disaster according to FEMA. Because of extensive flooding in the United States, there are many areas that would benefit from amphibious housing. This is especially true in coastal cities, as amphibious houses could reduce the high costs of house repairs due to damaging flooding. Damages would be minimal and mostly to the landscaping and out buildings. Unlike houseboats, these homes are built on solid ground; yet, when the water rises so do the houses. Each house is made of lightweight wood, with a concrete base that is hollow, giving the house buoyancy. The foundations are not anchored to the earth in Holland like they are in the United States. In a time of flood, the house rises from the ground and floats. They are attached to mooring posts with sliding rings, keeping the house from floating away. All of the electrical cables and utilities pass through the mooring posts. When the water subsides, the house settles back to earth in its original position. There are two major benefits to a floating house. The first being low insurance rates and the other is the reassurance that a resident’s home will not be destroyed by rising water, as their home will rise with the water. Of course, they might also need to own a boat as well as a car. Since there is a strong desire to live near the water, housing in these areas need to be able to survive the unpredictable rising water. 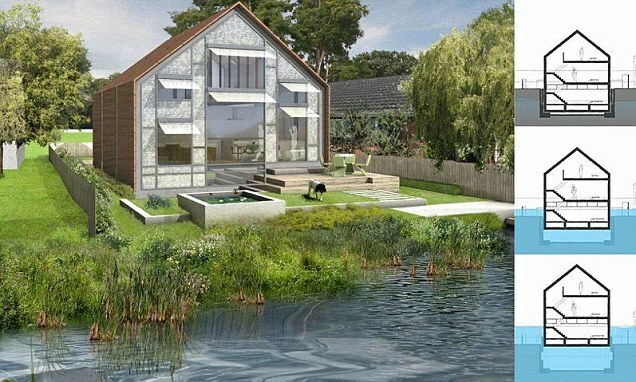 Work has begun on the United Kingdom’s first amphibious house, which is being built on the banks of the River Thames, and located just thirty feet from the edge of the river. It is being built on a fixed foundation, but it’s also designed to rise up and float should the Thames rise. When the water level is normal, the house sits on the base of the dock, but as the water rises from flooding, the dock fills with water and the house floats. The dock is made of reinforced concrete with four poles. The foundation of the house is honeycombed concrete, which gives the house buoyancy. The upper part of the house is made of lightweight timber construction that rests on a concrete hull, creating a free-floating pontoon, while the whole house is set between four 'dolphins' or permanent vertical guideposts to secure the house. These guideposts are similar to those found at marinas. The posts are integrated into the design of the exterior of the building. Amphibious houses offer clear advantages over elevated houses. Because the amphibious house is level to the ground, it ties in nicely with the landscape. Many coastal homes are built on stilts, which mean that the residents must go down a set of stairs to work in or enjoy their gardens or patios. Handicapped people have exceptional problems getting in and out of their home on stilts. Amphibious houses are built using prefabricated panels with steel framing. This construction method allows houses to be much lighter than traditional construction yet remain strong for everyday usage. Amphibious houses cost around 20 per cent more than the cost of building a conventional similar-sized home, but insurance costs should be much lower. Building costs are a one-time expense, whereas insurance is an ongoing expense. An amphibious house can also be an ecological building, which is not only architecturally pleasing but self-sufficient in producing energy. It could use solar panels and wind power for electricity and a passive heat exchange for heating and cooling. One room could be a solar room for a food dehydrator. If the house is close to the ocean, it could also have a water desalinator. A cistern could be added for the collection of rainwater, along with an organic water recycling treatment system for black and gray water. Using solar or wind power, an amphibious house could continue to have power while the residents wait for the water to subside. 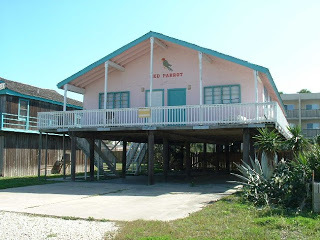 A self-subsistent building would have been ideal for Seaside, NJ, which was without power for weeks during cold weather. Climate scientists predict flooding will become even more frequent and initiate water to move inland from the Gulf of Mexico. Raccourci Old River in Point-Coupee Parish, Louisiana is an old time fishing community, which floods at least one day every year. Several people have converted their homes and businesses to be amphibious, but they ran into typical government bureaucracy. They are finding it difficult to obtain National Flood Insurance Protection for their properties after converting their homes to amphibious structures. To be eligible for flood insurance, FEMA requires that structures in flood-prone areas be "adequately anchored to prevent floatation, collapse, or lateral movement." Congress needs to change this regulation. While the United States is lagging behind, other countries are moving forward with plans to develop floating architecture, which has changed from a periphery market into a realistic opportunity. Creating floating buildings goes beyond architecture and is about a new vision for city planning. The concepts combine water-based buildings with land-based architecture protected against water using flotation fixtures, raised platforms or anchored structures. This flexible, integrated approach is vital for the future. Urban planners are creating floating structures that can counter new and unanticipated changes. One of the most ambitious projects under development is in the Maldives, where Waterstudio.NL was contracted by the Maldives government to design a complex of floating islands, including the Greenstar hotel that will feature 800 rooms, a conference center and a golf course. The $500 million project is set for completion by 2015. Shaped as a star and covered in stepped layers of green, the Greenstar Hotel is being pitched as a destination for conferences regarding climate change, as the Maldives is considered a leader on the topic. This group of islands in the Indian Ocean is just six feet above sea level and will be reclaimed by the ocean with just a three foot rise in water levels. Such planning is inevitable as our natural instinct is to survive, but there is much yet to do in regards to land-based survival from floods. Therefore we must change the public's perception of living on water by making the amphibious structures look and feel just like a solid foundation built structure. The only time you will see a difference between a floating house and the traditional one is during floods — when your house rises above the water and your neighbor's stays put and slowly sinks under the water. All forms of flooding are being considered, including rivers, oceans and changes in climate.